Several of you have inquired about sharing your Zentangle® art on tanglepatterns. I have been noodling for some time to figure out a way to implement this because there are technical and financial issues to consider such as server storage space and bandwidth consumed by people viewing the site. Then there’s my “free” time – there’s none left. Say you’ve created a Zentangle®, or a Zentangle®-inspired piece of art, featuring the tangle pattern Betweed. First, post your Zentangle® image on one of your free photo-sharing accounts such as Picasa, WebShots, or flickr. Then come back here to the Betweed page and in the comments post a link to your image. This gives everyone an opportunity to share their creations and it’s a great way to show off a particular pattern and the various ways each individual interprets it. It also gives everyone an opportunity to comment on your creation, by simply replying to your comment. Add your comment with the URL (link) to your image, as well as anything you might like to say about it. in your comment with your link, please indicate whether it’s a Zentangle® (3.5″ tile) or Zentangle-inspired art (anything else: larger formats, various media, etc.). Please link directly to a single image representing the relevant pattern, not an entire album or website. Here are a few of the free major photo-sharing accounts I know about. 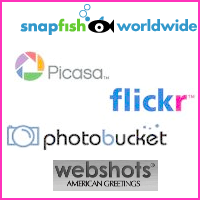 And for the really curious amongst us, here is a link to the motherload list of photo-sharing sites on Wikipedia. If you use one I haven’t named that’s easy to use and reliable, please share in the comments on this post. So, ladies and gentlemen, start your engines and show us your Zentangles! PS – for scanning tips, see the comments section on this page. Wow, this is quite the endeavour. I’d like to be of whatever assistance, to help accomplish this and keep it going. You go girl! This is great – I can’t wait to see the Tangles! !